Sunday January 19 1908 It was so late when we got up that I was busy all forenoon with the work and the dinner. Will took the horse down town to be shipped today. I took a bath after dinner and read some. Did some writing in the evening. Weather beautiful. 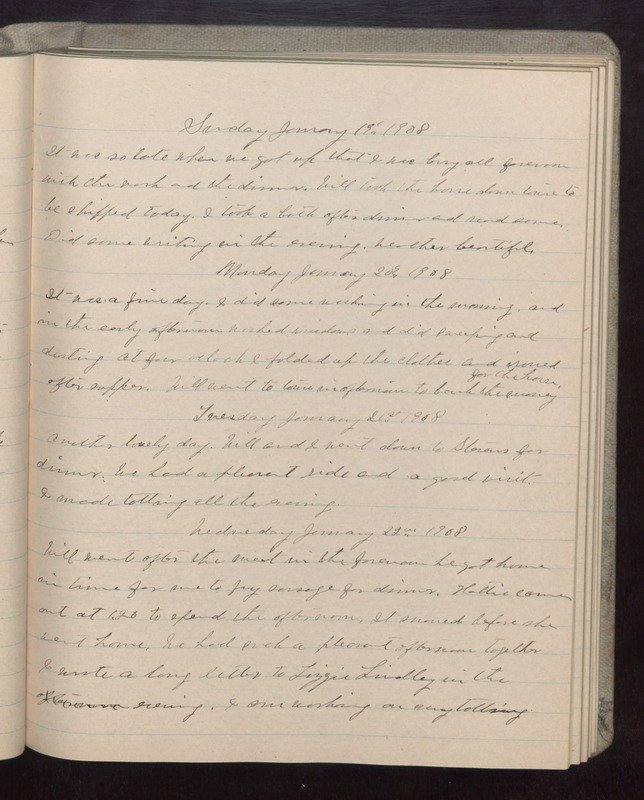 Monday January 20 1908 It was a fine day. I did some washing in the morning, and in the early afternoon washed windows and did sweeping and dusting. At four oclock I folded up the clothes and ironed after supper. Will went to town in afternoon to bank the money for the horse. Tuesday January 21st 1908 Another lovely day. Will and I went down to Stevens for dinner. We had a pleasant ride and a good visit. I made tatting all the evening. Wednesday January 22 1908 Will went after the meat in the forenoon he got home in time for me to fry sausage for dinner. Hattie came out at 1.20 to spend the afternoon. It snowed before she went home. We had such a pleasant afternoon together I wrote a long letter to Lizzie Lindley in the evening. I am working on my tatting.